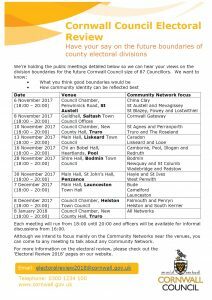 The Boundary Commission is running a twenty-one-week public consultation which started on the 26th September 2017 during which time the Commission is inviting proposals for new division arrangements for Cornwall. The consultation will close on 19 February 2018. After considering all representations made during this consultation, the Commission intends to publish draft recommendations in May 2018. There will then be a further period of consultation on the draft recommendations. Final recommendations are expected to be published in October 2018. The new electoral arrangements will come into effect at the local elections in 2021. The Boundary Commission will make recommendations on the number of councillors, the number and boundaries of wards, and the names of wards. It can also recommend changes to the electoral arrangement of parish and town councils i.e. the number, names and boundaries of parish wards; and the number of parish councillors for each parish ward. However, this is only in circumstances where the parished area is to be divided between wards. The Commission cannot, as part of this review, consider changes to the external boundaries, or create new parishes. Under the Local Government and Public Involvement in Health Act 2007, changes to external parish boundaries are the responsibility of the local authorities. In this case that would be Cornwall Council. 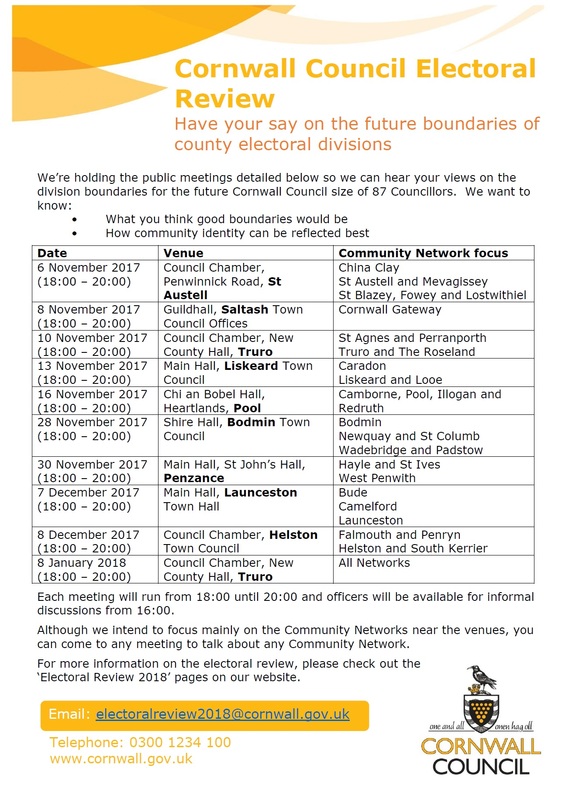 This is a public consultation and we welcome views from individuals and organisations across Cornwall on where they think new division patterns should be drawn. The Commission is minded to recommend that 87 councillors should be elected to Cornwall Council in the future. It is now inviting proposals to help it draw up a pattern of divisions to accommodate 87 councillors. To deliver electoral equality where each councillor represents roughly the same number of electors as others across Cornwall. We are asking local people and organisations for their views as to the best pattern of divisions for Cornwall which meet the requirements set out above. The Commission will treat all submissions equally and will judge each case on its merits and against the statutory criteria. If you wish to put forward a view, we would also urge you to ensure that evidence supports your submission. For example, if you wish to argue that two parishes should be included in the same electoral division, make sure you tell the Commission why they should be together, providing evidence about community facilities, ties, organisations, and amenities, rather than simply asserting that they belong together. There is plenty more advice on our website about how you can get involved in the consultation and put your views forward. The website includes the technical guidance that explains the process and our policies as well as guidance on how to take part in each part of the process. We have set up a page on our site which is dedicated to the review of Cornwall where you can find all the relevant information. You can also access interactive maps of the current division boundaries across Cornwall on our specialist consultation portal. The portal also allows you to draw your own boundaries, mark areas of interest on the map and upload documents directly to the site. – By email to reviews@lgbce.org.uk. You can view the Cornwall Council draft mapping site HERE you can see the existing boundaries and suggested boundaries by clicking on the layers. Splitting Gwinear Gwithian is not satisfactory. Gwithian in particular has special problems that are known and dealt with through the the G-G Parish council etc. I’m sure our Council has opposed this. We now have a neighbourhood Plan in place and this should give us a say.